Notes: Wharton Hall in Wharton, Cumbria, England, is a medieval fortified manor house. At the heart of Wharton Hall is a 15th-century hall, built from local limestone by the local Wharton, possibly Richard Wharton. During the Pilgrimage of Grace in 1536 the manor was besieged by the forces of Robert Aske and after 1544 Lord Thomas Wharton extended and fortified the manor, building a gatehouse, great hall, kitchen and surrounding walls in a medieval style. The result was a grand property, with the great hall 68 feet long. 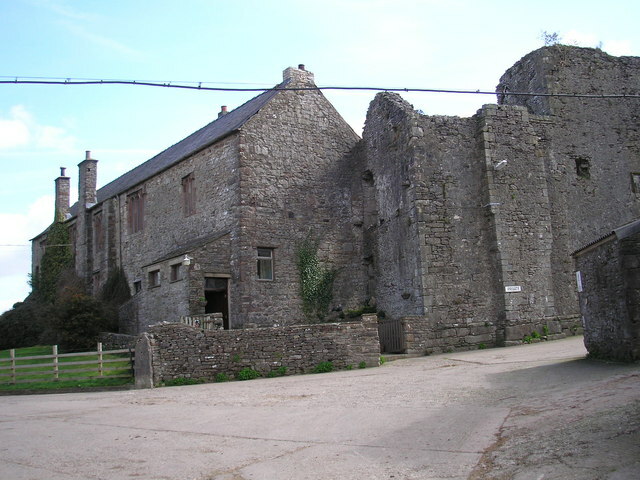 The Wharton family preferred to use Healaugh Priory as their main house after the 16th century, and the property fell into ruined. In the 18th century, Lord Lonsdale restored the building in 1785, adding additional battlements. It was restored again in the 20th century to its current condition. This site is a scheduled monument and grade I listed building. "Wharton Hall (1137207)". National Heritage List for England.